Why buy a Browning gun safe? 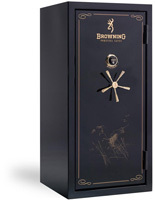 When you first see a Browning gun safe, you notice the beautiful, high-gloss enamel finish, attractive game scenes and scroll designs and the gold-plated spoke handle. It is what you can't see that really matters. Within the internal working mechanisms of Browning gun safes you'll find features most other safe manufacturers do not provide. It is these features and components that are vitally important to your peace of mind and the security of your firearms and other valuables. 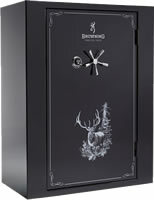 Behind the attractive looks of a Browning gun safe are the most advanced and protective designs available. No corners have been cut, no safety or security feature have been overlooked, no fire protection option not addressed. 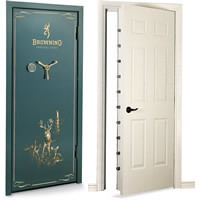 Browning safes are the most innovative, best constructed gun safes in the industry. We constantly strive to make improvements to security, fire protection, storage and convenience to keep them ahead of the competition. 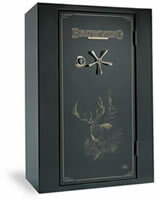 You can be confident that your Browning ProSteel Safe will give you the latest and most important features available.